The tire is an essential part of a vehicle that makes movement possible. Of course, it is easy to identify a tire and a tread pattern that works best for their vehicle, but when it comes to knowing how the tire was made, many dealers shake their heads. To understand the full potential of a tire, it helps to know how they are made. To begin building a tire, you will need supplies. 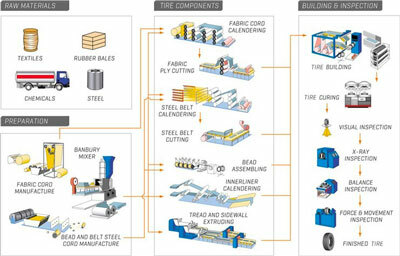 Several components are necessary to build a tire including rubber, fabric and steel. There are four types of rubbers used in tire construction: natural rubber, styrene-butadiene rubber, polybutadiene rubber and butyl rubber. The inner lining of the tire is made with butyl rubber where the sidewalls are made with the other three types of rubber. Several compounds and chemicals are added as “tire filler” including carbon black and silica, antioxidants, antiozonants, anti-aging agents and a combination of curatives and accelerators. The compounds are combined based on performance requirements for the tread, sidewall and apex. The compounds are mixed together according to a temperature-controlled sequence that prevents damage of the ingredients. Once the compounds are mixed, the batch forms a sheet called a “slap” which is transferred to the calendaring process, which presses the compounds into cords. Fabric and steel cords are used in the tire construction to reinforce strength. Materials that are used include aramid, cotton, fiberglass, polyester, rayon and steel. Fabric cord is treated with an adhesive to bond with the rubber. Fabric cord is used for strength, shrinkage, stretch and elasticity. The steel cord helps with strength, elongation and stiffness of a tire. The steel is made with a high carbon content and brass-coated strands are twisted together to build the cord. 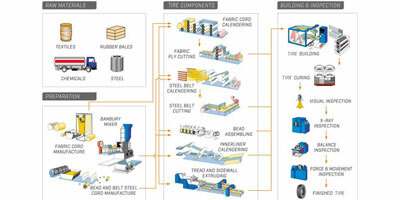 A calendaring process binds the rubber compound with the fabric or steel cords. Once the calendar machine applies the rubber compound to the cords, pressure is added to compress the rubber compound with the cords. Ply is measured by the quality of the sheet that was produced after calendaring based on thickness and spacing between cords. The sheet is cut into different sizes, shapes and angles based on the tire’s identity. The tire’s bead is the anchor that connects the plies and locks the tire onto the wheel so it will stay on the rim. The bead is measured precisely to make sure the tire can be mounted and not come off in loading or cornering positions. Tire tread is the portion of the tire that comes in contact with the terrain. The tread is created by simultaneously extruding rubber compounds are merged into an extruder head then a die plate where the shape and dimensions are formed. The tread is cut to meet length and weight measurements for the tire. The construction of the sidewall is built in a similar way to the tread. A tire is ready to be built after all of the components have been assembled. Radial tires are built on a flat drum where the inner liner is wrapped around a drum and layers of ply are added. Beads are positioned and a bladder on the drum is inflated to force the body plies to cover the bead. The sidewall sections are added to both sides and a machine is used to apply the belts, nylon cap and tread. Curing is the final step of the tire’s construction. Heat and chemical reactions mold the sidewalls and tread. Once the tire has cooled after the curing process, it is ready to be tested. Before tires leave the manufacturing facility, they are inspected and tested for quality, performance and safety. Once it passes an inspection, the tire is ready for the road.